“One day you’re in, the next day your out.” The fashion world is a one of fastest growing industry in the world. Some can be as clueless to fashion just as they are clueless to which colors look presentable. Yet, there are some who are loyal customers of a certain brand name. These can include the high-end couture, the ready-to-wear from high end designers, as well as the occasional lucky bargains found at retail stores like TJ Maxx, Marshalls, Ross, Zara, Macy’s, and H&M. As for me, fashion is a great way to express yourself and something different that not everyone can understand. We can't pin-point exactly when the fashion industry began but I would assume that the 1800s had some influence on the first fashion designs. Around that time women were wearing long, flowly Empire dresses which included high waistlines in the design. It was the extremely elegant . The first fashion shows, however, were not as extravagant. The designs were what was in the department stores that were on the sale rack. The shows were also filled with family and friends of the department store rather than buyers. Slowly things began to change and the fashion shows turned out to be sold out, “must see” events of the season. Fast-forward to today, Fashion Week is in every major city and is the platform where established designers and new designers alike showcase their designs. It's also one of the hottest events to attend; that is if you get an invitation. 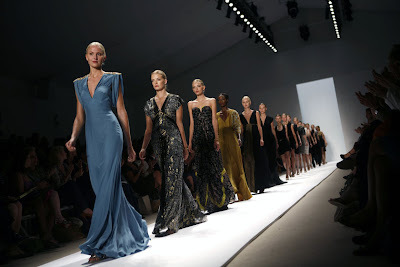 Unlike it's humble beginnings, fashion shows today are attended by celebrities, media outlets, and buyers. Fashion has come a long way since then and continues to change it's style every season. It is one of the fewest industries that is present in every aspect of our lives, from sports to work to leisure. Which is why we should consider it since it encompasses our lives without us realizing it. And with that in mind, I ask, are you in or out? This was a guest article by our lovely fashion intern Erika. Erika Varner is a junior at Virginia State University in Petersburg, Virginia and is living in Hampton, VA. She is currently majoring in Mass Communications. Erika plans on pursuing a career in journalism with a focus on writing about fashion. It's great to have Erika on board!